Tan is a truly great detective. She is always snooping. Sometimes she imagines crimes that do not exist. But this time Tan is onto something big. So big, it involves mysterious white flashes in the bush and an unexpected gypsy van. Unfortunately, Tan's Mum is full of ideas about how to keep the family busy over the school holidays. Will there be time to investigate properly? A strange car makes repeated appearances, Emerald disappears unexpectedly and magical cupcakes offer dastardly predictions. 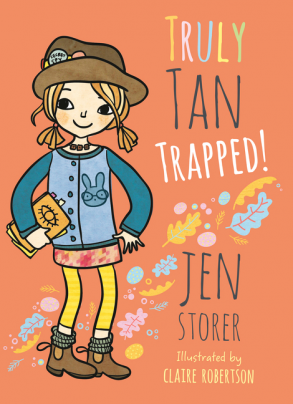 Tan's adventures with her best friend Gloria are more exciting than ever in Truly Tan Trapped. The question is, are she and Gloria in too far over their heads? Will they survive? Can anyone possibly save them? It will take a great detective to sort out what's what in Truly Tan Trapped.